BSRE, the developer who had plans for a 3,000 unit development at Point Wells, has decided not to accept the recent decision by the Snohomish County Hearing Examiner to deny the application. The developer has filed a motion asking the Hearing Examiner (HE) to reconsider his decision, the first step in what may be further legal action to overturn the denial. The motion lists what BSRE claims are multiple instances where the HE incorrectly interpreted the law or made findings not supported by the facts introduced in the public hearing. The motion also includes new evidence that BSRE claims the HE should consider because it was not available at the time of the public hearing in May, and includes changes to the application in response to issues identified in the hearing. The Hearing Examiner cited provision 30.34A.040(2)(a) of the County Code to rule that proposed buildings in the Upper Village area (the area east of the railroad tracks) must be severely limited in height because they were too close to neighboring residential zones in Woodway. BSRE argues that this section of the code only mentions specific Snohomish County residential zones, not the Woodway zones cited by the HE, so it can’t be used to limit building heights in that area of the property. The Hearing Examiner found that BSRE placed several of its proposed buildings within 150 feet of the Ordinary High Water Mark (OHWM) when no development is allowed in that buffer zone. The HE further found that BSRE was derelict in not identifying the OHWM earlier in the application process. BSRE argues that they found out about the need to identify the OHWM only recently and immediately moved to identify the mark and revise their plans. The motion includes revised plans that now identify the OHWM and remove all buildings in the 150 foot buffer area and claims that this late submission should be considered by the HE. Unexplained is why the County had to point out the missing OHWM when BSRE at any time in the last seven years could have read the County Code provision that clearly states the OHWM must be used to establish the 150 foot buffer area. The normal height limit for the development is 90 feet, but the developer is allowed to build up to 180 feet if the site is near a high capacity transit route or station. 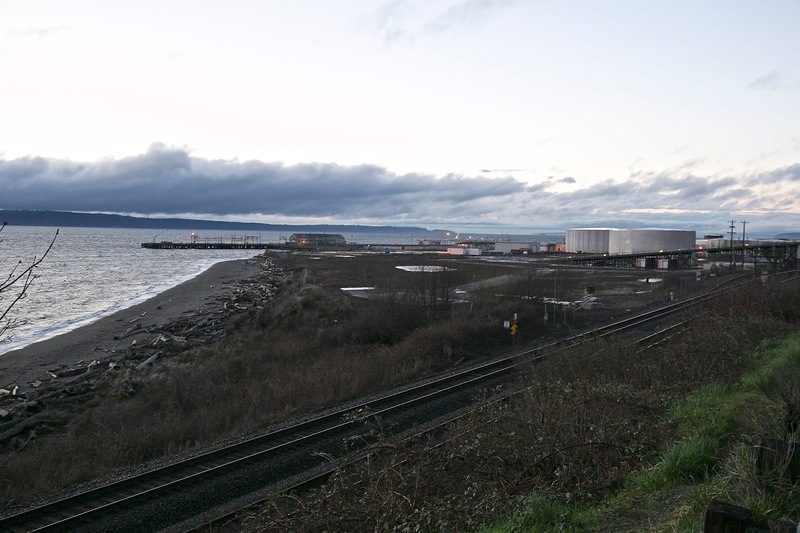 While the application claimed the site was near a high capacity transit route and included more than 20 buildings that were over the 90 foot limit, the Hearing Examiner ruled that BSRE had not done enough work with Sound Transit or Burlington Northern Railroad to ensure that any high capacity transit would actually serve the site, and thus all buildings must meet the 90 foot height limit. BSRE argues that County Code section 30.34A.040(1) does not require actual service, just proximity, so the fact that the Sound Transit trains travel across the site is enough to qualify for the added height. BSRE also argues that a mention of a possible Richmond Beach station in the appendix to a 2005 Sound Transit environmental statement and a single 2010 letter from Sound Transit shows that they have been diligent in pursuing a Sound Transit stop at Point Wells. Unexplained is why, when Sound Transit has since proposed 2 additions to the system (ST2 and ST3) that take system planning beyond 2040, neither included any mention of a potential Richmond Beach station. Finally, BSRE claims that they will establish a water taxi service between Point Wells and Edmonds to fulfill the need for high capacity transit. Unexplained is why BSRE has not provided any documentation showing they have contacted the Port of Edmonds to confirm the taxi would be allowed to dock. Snohomish County Code section 30.62B.340 states that no buildings are allowed in a landslide hazard area unless it can be shown there is no alternate location for the buildings, and the developer can prove they will be able to complete geotechnical modifications that will make the buildings just as safe as if they were located outside the area. The Hearing Examiner ruled that BSRE had not fulfilled either of these conditions. BSRE argues that their project architect reviewed the site plan again to confirm there is no other possible location for the Upper Village buildings. The architect concluded that there was no other location for the buildings that was as good as the proposed location. Unexplained is why saying that this is the best location proves there is no alternate (though possibly less desirable) location. BSRE also includes a revised geotechnical report that purports to show the buildings will be just as safe as if they were placed outside the hazard zone, and claims this information could not have been provided to the HE during the May public hearing. Unexplained is why this information could be produced in the two weeks following the original ruling, but not in the seven years the application was in process prior to the hearing. The Hearing Examiner ruled that he would not grant BSRE any further extensions because BSRE has not been diligent over the last 8 years in resolving issues raised by the County. Denying any further extension allowed the application to expire on June 30, 2018. BSRE argues that they were led to believe that the County would grant them another extension, and that all the work they had accomplished in the last 3 months proved they would work diligently to complete the application if they were granted more time. Unexplained is why BSRE submitted very little work in the 5 years before January 2018 but was able to accomplish so much in the last 3 months leading up to the May hearing. The Hearing Examiner must reply to the motion. His ruling could accept some or all of BSRE’s arguments and his ruling on the motion to reconsider could range from upholding the original denial to reversing his position and granting BSRE an extension. The Hearing Examiner states that if BSRE does not like the ruling on the motion, they can appeal to Superior Court. BSRE cites sections of the County Code they claim allow them to appeal to the County Council before going to court. It’s unclear at this point who is right. Stay tuned. BS. This shouldn't be allowed. Game over, BSRE!